Rosebridge Manor PSW Rose Thompson received the home’s 2017 Everyday Hero Award on her last day on the job after 15 years. As a personal support worker (PSW) at Rosebridge Manor, Rose Thompson reflected OMNI Health Care’s mission, vision and values for the 15 years she worked at the Jasper, Ont., long-term care home, her colleagues say. This is why the Rosebridge team nominated Rose with the 2017 Everyday Hero Award, shortly before she retired recently. “The deeds of the Everyday Hero are not glamorous or high profile but they are vital and worthy of recognition. The small gestures of kindness and caring that fill their days are quiet acts of heroism,” her colleagues write in their nomination. “This PSW is compassionate and leads by example. She goes above and beyond the call of duty. Residents’ always come first and have over the past 15 years,” they say of Rose. Team members say they also nominated Rose for her dedication to residents, families and her co-workers at Rosebridge Manor. Having worked at Rosebridge for 15 years, Rose made many friends, and her colleagues say she is missed. They presented Rose with the award during her last shift. OMNI announced this year’s recipients of the Everyday Hero, Inspired Leader and Elisabeth Hinton Memorial awards at the Quality Forum in Calabogie, Ont. in May. 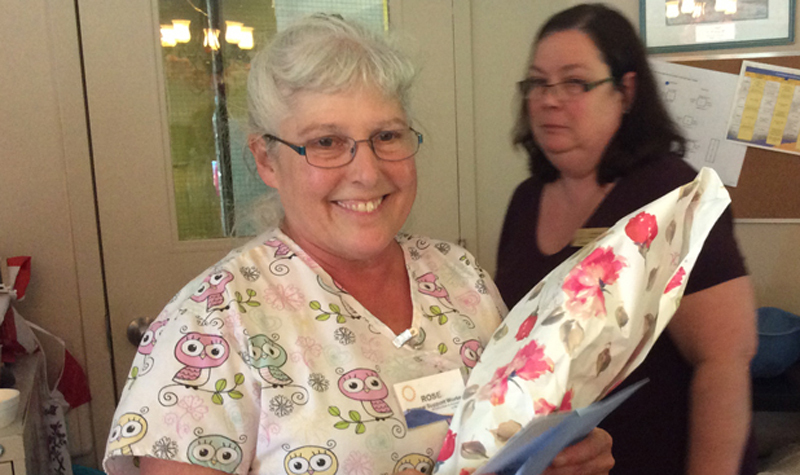 Managers from OMNI’s long-term care homes were presented with the names of the award winners. Homes are presenting the awards during their own ceremonies.